Phylogenetic relationships follow Fuchs et al. (2011). Amadon D. 1964. Taxonomic notes on birds of prey. Am. Mus. Novit., 2166. Guineafowls, vol. 2. Lynx Edicions, Barcelona, p. 253. Bierregaard R.O. 1994. Micrastur ruficollis. In: Del Hoyo, J., Elliott, A., Sargatal, J. (Eds. ), Handbook of the Birds of the World: New World Vultures to Guineafowls, vol. 2. Lynx Edicions, Barcelona, p. 253. Schwartz P. 1972. Micrastur gilvicollis, a valid species sympatric with M. ruficollis in Amazonia. Condor 74, 399–415. Whittaker, A., 2001. Notes on the poorly-known Buckley’s Forest-falcon Micrastur buckleyi including voice, range and first Brazilian records. Bull. Brit. Ornithol. Club 121, 198–208. Whittaker, A., 2002. A new species of forest-falcon (Falconidae: Micrastur) from southeastern Amazonia and the Atlantic rainforests of Brazil. Wilson Bull. 114, 421–445. Stresemann E., Amadon D. 1979. 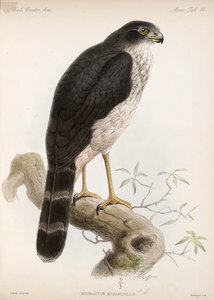 Order Falconiformes. In: Mayr, E., Cottrell, G.W. (Eds. ), Check-list of Birds of the World, vol. 1, second ed. Museum of Comparative Zoology, Cambridge, MA, pp. 271-425. Page: Tree of Life Micrastur. Forest Falcons. The TEXT of this page is licensed under the Creative Commons Attribution-NonCommercial License - Version 3.0. Note that images and other media featured on this page are each governed by their own license, and they may or may not be available for reuse. Click on an image or a media link to access the media data window, which provides the relevant licensing information. For the general terms and conditions of ToL material reuse and redistribution, please see the Tree of Life Copyright Policies.